It’s official. Skecher’s shoes, Bobs – is NOT associated with Toms. I knew something with me just didn’t set right for a reason when I saw the commercial showing Bobs Shoes and mentioning Toms. There were a few commenters that left messages that I was wrong and that Toms was a sub-brand or what not and that Sketchers and Bobs were working together. I am TOTALLY open to being wrong. I researched. I even asked Skechers for an explanation. Nothing I found (nor did I receive a response) stated there was any association. Toms today, released a post on their blog that clarifies any confusion any of you may have had (thanks ST!). If you have seen the Skechers TV commercial for “BOBS” and wondered what the heck it was all about, you’re not alone. We about fell out of our chairs when we heard the voiceover state, “BOBS is proud to join a company like TOMS,” as they show young women dancing through a forest in what appear to be replicas of our shoe designs. 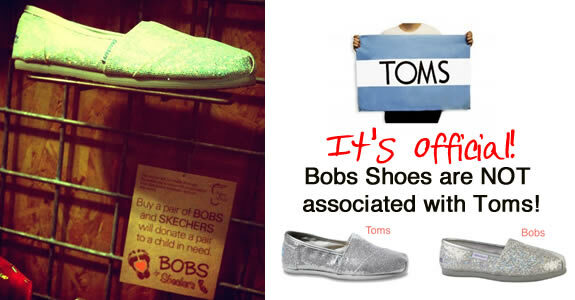 Maybe “join companies like TOMS” should have read “imitate shoes like TOMS?” We’re not quite sure. Now don’t get us wrong. The fact that Skechers is pledging to give shoes to those in need is great, but we wonder, why do they need the alpargata to do that? Don’t they have a ton of shoe designs? Well, those are just a couple of questions we have, and from your blog posts and tweets, it seems some of you are pretty confused and concerned. Seems this company’s community (and shareholders) might have the same questions, but if not, well, we’ll just continue to focus on spreading the TOMS movement, making great shoes (and eyewear) and serving those in need through our One for One model. It’s not surprising that you’ve been vocal about this, and until now, we’ve been a little too busy to comment. So thank you. Please know that we really appreciate your thoughts, passion and support in clearing up any confusion in this matter. And, of course, assuring anyone who asks that TOMS is in NO WAY associated with Skechers, and will never be. Thanks so much Toms for the explanation. And us, like you – wish that Skechers would just use any one of their other shoes designs for a giving cause rather than trying to take advantage of the success of the Toms brand.